I don't think I will ever tire of our shore visits. There's just something about being ocean side that fills my soul so completely. 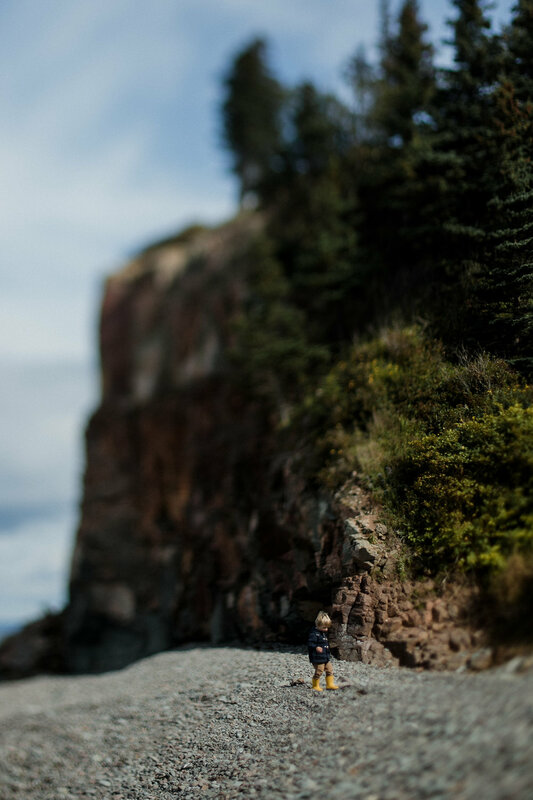 It's pretty typical for us to pack a breakfast or lunch and hop in the car to drive to our favourite spot on the coast. We take the same route each time and the kids point out all their favourite land marks. First we pass a row of poplar trees bordering farm that the kids always say are the straightest tallest trees ever. Gavin scans the passing fields for tractors and cows and loudly announces successful sightings. The next favourite is the "wavy guy." He lives at the little car dealership on the corner and dances to our music every time we turn down his road. Bowen says he loves Katy Perry. Once we hit about halfway, we see the horseback riding school and Remy tells me that she's going to be a horse rider when she grows up. I think she may need a few lessons before pursuing it professionally. Finally we start out climb up the mountain and Gavin oohs and ahhs at the view of the valley. Sometimes I am treated to a rousing rendition of the bear went over the mountain until we reach the top and then it immediately switches to we're going down to the ocean, over and over until we can see the first hint of water peeking through the trees. Everyone seems to get a little quieter (for 2.5 seconds) and the beasties make their tide observations which include how up or how out they think it is and wether it's coming or going. This continues on while we reach the end of the paved road and follow the rut laden gravel around and down, a short stint through the woods, over the little bridge and finally stopping at our little slice of the bay. It's not private, we meet other people coming and going and find remnants of bonfires and garbage that we toss into the pit to be burned by it's next visitors, but we almost always have it to ourselves so we call it ours. 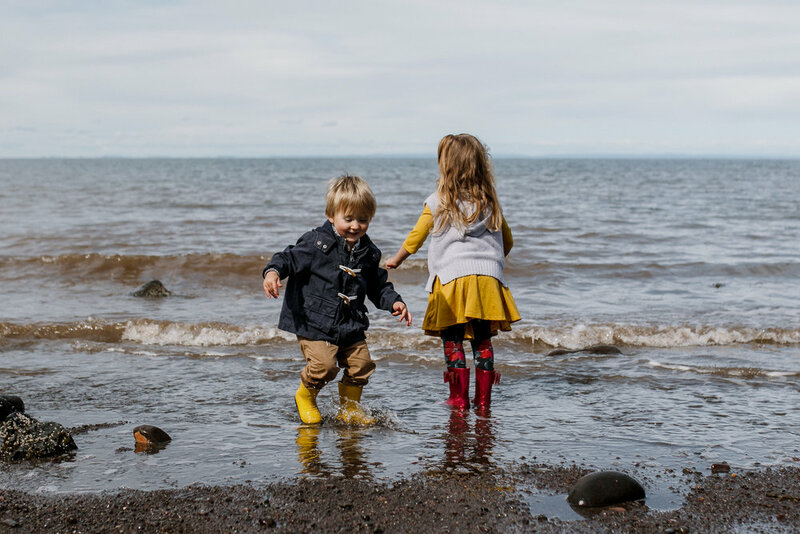 There's a river that pools in the summer creating the perfect little toy boat marina and rock launch pad for Gavin. There's a patch of fine black gravelly sand that warms up in the sun and makes the perfect place to sit and toast your bottom while digging with shovels and tractors. When the tide is in, the waves gently pull at the rocks, tumbling them back and forth, polishing them to an almost perfect roundness. There are cliffs and jagged bits of rock that the girls scale bravely, always going just a little higher, and big smooth boulders that are the perfect perch for selkies and mermaids. Sometimes we are treated with thick delicious fog and others huge crashing waves that reach for us, daring us to come closer to be swallowed up into the sea. When the tide is out, the shore seems to stretch forever. Because our little bay boasts 50 foot tides, we end up with a lot of room to play and comb for ocean goodies. So far our favourites are gnarly bleached pieces of driftwood, perfectly polished stones, a few golf balls and the odd piece of twisted rusty metal jutting out of the sand. If we're lucky, sometimes we can find tiny little green crabs hiding in the tide pools and snails shells, both occupied and empty and up for grabs. 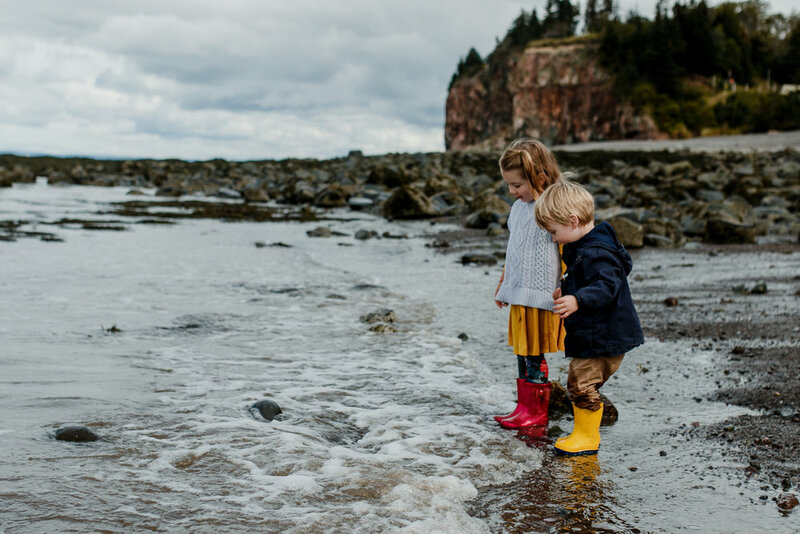 As the water recedes away from the rocky cliffs, we make can our way down the beach to the little two tiered waterfall that the kids splash in in the summer. As far as we're concerned, our spot is the best spot. It's different each time we visit depending on the tides and the weather. There's a little bit of everything and a big ole' log for Mama to sit on and enjoy a coffee while it's still warm. Even as a knobby kneed kid, I had a spot by the river that I called my own. I've always felt the need to find a spot. The perfect spot that feels somehow like mine, like it belongs to me and I belong to it. A place to soothe worries, feed the soul, refresh, reflect and just breathe it all in. A place where we can planely and simply just be. Do you have a favourite escape? Take me with you for an extra special session!